Types of Quonset Huts – Quonset hut is a prefabricated structure which is made of steel and is used for semi-permanent shelters. There are different types of Quonset huts available in the market. So users can select them in accordance with their need and requirement. T-Rib Quonset Hut looks like Nissin hut. Size of the hut is 16′ x 36′ and 16′ x 20′. Inside walls of the T-Rib Quonset Hut are made of Masonite. T-Rib Quonset Hut has insulated wall. Corrugated metal sheet is used for the outer wall of the T-Rib Quonset Hut. Quonset Redesign was first manufactured by George A. Fuller. Quonset Redesign was 35% lighter than normal Quonset hut. As it was light weight, it was easily movable. Standard size of the hut was 16′ x 36′ and 24′ x 60′. Quonset Redesign was modified by George A. Fuller Company, Entire building was divided into two parts. After assembling the parts, your house would be ready. It was very easy and simple method, and took a few hours to make the building. Light weight galvanized steel sheet is used for the sidewall of this hut where the panels are placed horizontally so that it can be shipped easily. So Stran-Steel Quonset Hut takes comparatively less space while it is shipped. Generally 1/2 inches to 1 inch ply board is used for floor. Normal size of the hut is 20′ x 48′ and 20′ x 56′. James Manufacturing Company of Fort Atkinson, Wisconsin produced Jamesway Hut. 16′ x 32′ is the size of the hut. But if users want they can expand it up to 4′. Wooden ribs and insulated fabric covering are used in this hut to make it more comfortable. 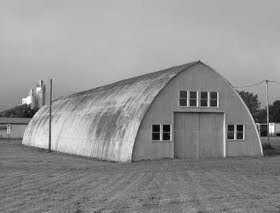 This type of quonset hut specially used by the Army Air Corps. It is also appropriate for arctic weather. This is Canadian style of quonset hut. Plywood-clad and wood-frame were required to build it. 16′-2′ x 37-0′ is the standard size of Portaseal® Hut. Pacific Hut was manufactured by Frank Hobbs. Though quonset hut was prepared by the steel sheet but wooden quonset hut was also available and equally useable product. Actually wood and steel both are rust proof. Size of the hut is 18′-6″ x 37′-4″. It is apt for tropical weather condition. Morrison-Knudsen Company was developed Emkay Hut. Specialty of Emkay Hut is its length and width can be adjusted as per weather condition. 20′ x 48′ is the normal Emkay Hut size. Armco Hut was produced by Butler Manufacturing Company. It was made of heavy iron. 20′ x 50′ is the normal size of Armco Hut but buyers can access small, medium and large size. Butler Hut was developed by Butler Manufacturing Company. 8 feet radius ribs and U shaped roof are the eye-catching features of the Butler Hut. Top of the hut is larger than semicircular shape. 16′ x 48′ is the normal size of the Butler hut with four feet length expansion facility. “Steeldromes” is the popular name of the Cowin Hut. Its half circle roof does not allow accumulation of snow. Generally its large shape and wide width is the most advantageous feature. Mainly Air force troops use Cowin Hut for semi-permanent shelters. 36′ x 60′ is the standard size of Cowin Hut. 40′ x 100′ size Utility Building is the also known by Elephant Hut. It is larger edition of Quonset huts. Utility Building is perfect choice for the tropical climate. 82′ x 102′ Multiple Utility Building is stretchable hut. Width of the hut is expanded up to 61′-6″ and length 100′. So users can stretch it in both directions as per their requirement. If you are planning to purchase a Quonset building, there are a lot of options to choose from. Go for it, you have a large variety waiting for you.